It is my pleasure to introduce our first regular featured column. The rationale behind this addition to SiSAL Journal is that although over the past three years we have successfully showcased examples of research and practice in many contexts, we felt we wanted the opportunity to explore an unfolding story of one institution’s engagement with self-access. As this special issue deals with offering structured support for self-access learning, it seems appropriate that our first case study should be connected with self-access curriculum matters. Katherine Thornton has agreed to be the column editor for the first case study. 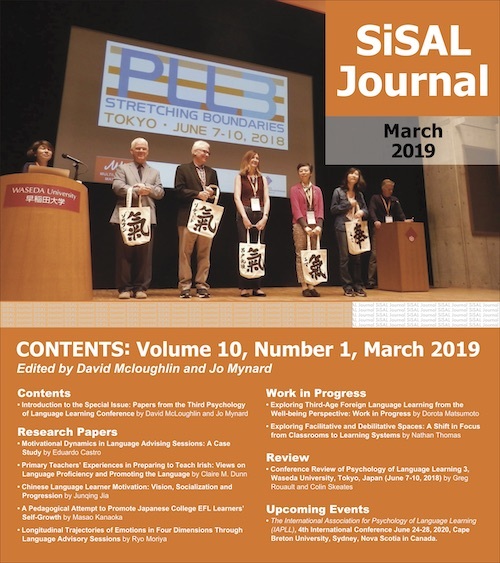 Over the coming few issues of SiSAL Journal, she will introduce a series of articles connected with the unfolding curriculum story of one institution in Japan. After ten successful years of providing self-access materials and services to learners, learning advisors working at the SALC at Kanda University of International Studies are engaging in a thorough curriculum review. This process was initiated in order to re-evaluate the needs of the students and other major stakeholders, draw upon the literature and the experience of team members in order to implement informed changes for the future. Over the coming issues, Katherine Thornton will work with other authors to present different stages of the project. It is hoped that the framework and approach that the research team members at KUIS have taken might serve as a resource to practitioners elsewhere who are reviewing their own curricula for self-directed learning skills or establishing one for the first time. If you would be interested in sharing a series of connected articles related to one project in this way in the future, please contact the editor.